Someone is stalking the UCLA Medical Center -- a depraved madman who is preying upon the staff, particularly those who are young and female. No stranger to the terrible ravages of senseless violence, E.R. Chief Dr. David Spier must keep the emergency room running smoothly and efficiently, even as his terrified co-workers wonder who will be the next victim. But when the monster himself is dragged into the E.R. in handcuffs -- hideously burned, suffering, and begging for mercy -- the nightmare is far from over ... it has only just begun. A single act of humanity is about to unleash a bloody wave of horror that threatens to engulf everyone and everything Dr. Spier cares about. His most sacred oath as a healer has become a death sentence -- for David Spier ... and for a city under siege. "In this adeptly researched, well-constructed tale about science gone awry.The action comes fast and steady." "Enticing.a smoothly written, gripping fabric of believable incidents, ethical questions and changing relationships." "A break-neck paced novel whose twists and turns will chill you to the last page. Great psychological suspense." "Compelling.Gregg Hurwitz is the heir apparent to Robin Cook." "Hurwitz is a brilliant storyteller.He has written a fast-paced plot with nicely defined characters." ".a gripping page-turner.that sticks in mind long after the last page is turned." ".a spooky, surprising and unsettling thriller. Good character, a suspenseful plot and a shock of an ending." ".the perfect blend of suspense, pacing, strong storyline, compelling characters, and a villain who will knock your socks off." 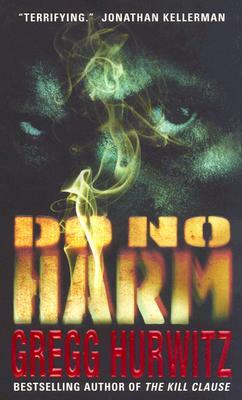 "DO NO HARM is a terrifying and savage descent into the darkest corners of evil and madness."